Tarik Black never let his chin drop. He never quit working hard in practice. He never stopped making the rest of his Kansas teammates laugh until their stomachs hurt. If anything, once he was relegated to the bench, Black did all of that stuff even better. His positive attitude paid off on Saturday. Black got a chance to play extended minutes for the first time in weeks against Georgetown, and the Memphis transfer responded by plowing through a physical bunch of Hoyas for 17 points in the 18th-ranked Jayhawks’ 86-64 victory. "Tarik was better today than at any point in time, but that’s how he’s been practicing every day," Kansas coach Bill Self said. "His attitude has been great." 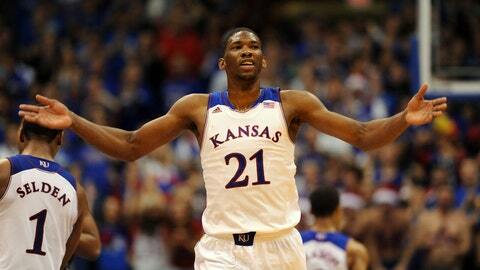 Black had lost his starting job to freshman Joel Embiid, who also had 17 points against the Hoyas. But while he almost certainly won’t win it back any time soon — Embiid has been that good — he at least gives Kansas two formidable post players capable of dominating a game. "We can definitely do some damage on the inside," Black said. Andrew Wiggins added 12 points and Naadir Tharpe had 10 for the Jayhawks (8-3), who pushed their non-conference home win streak to 67 games in Georgetown’s first visit to Allen Fieldhouse. The Hoyas (7-3) tried to use the kind of muscle that has suited them so well in the rough-and-tumble Big East, but all they did was get into debilitating foul trouble. Markel Starks scored 19 points and D’Vauntes Smith-Rivera had 12, but they were forced to carry the burden almost entirely by themselves. Bruising big man Josh Smith, who had been averaging 14.1 points, scored just five before fouling out. Moses Ayegba and Nate Lubick also fouled out for Georgetown. "They did a good job of getting us in foul trouble," Hoyas coach John Thompson III said. "I think particularly Black played very well today. Whenever we felt like we were making a step toward cutting into the lead, he’d get a rebound or make a three-point play." The game was so physical that Jayhawks forward Perry Ellis left early in the second half after taking an elbow to the back of his head. Ellis tried to stay in the game but missed a free throw so badly that he took himself out. He never returned from the locker room. "If he had a concussion, it’s very, very slight," Self said. "He did bruise the nerve in his neck, and that caused the problem. It’s something he’ll be able to come back from in a short time." Just as every other team has done this season, Georgetown tried to combat the Jayhawks’ length and athleticism by employing a zone defense in the first half. The only problem was the Hoyas were so mired in foul trouble that they didn’t have anybody to occupy the inside. Kansas built its 44-34 lead thanks in part to a 14-3 run fueled by its defense. Georgetown at one point went more than 10 minutes without a field goal, missing five straight attempts, turning the ball over and even getting hit with a shot-clock violation. "All the credit goes to them," Lubick said. "We didn’t come ready to fight." Ayegba and Lubick had three fouls each by halftime, and three other Hoyas who spent time guarding the paint had picked up two fouls. That included Smith, who picked up his third in the opening minute of the second half and had to spend long stretches on the bench. Embiid and Black took advantage of his absence. When the Jayhawks’ two post players weren’t scoring on an array of layups and dunks, they were getting hacked. Embiid wound up 9 of 12 from the free throw line, while Black was 7 of 9. Georgetown tried to get back into the game midway through the second half, trimming its deficit to 59-47 on Jabil Trawick’s basket. But frustration boiled over for the Hoyas when Trawick clobbered Wiggins on the way to the basket, and the teams nearly came to blows. Wiggins responded by knocking down a 3-pointer in Trawick’s face from the wing, and in a matter of minutes, the Jayhawks had built a comfortable lead. Embiid put an exclamation mark on it when he followed up a miss by Wiggins with a thunderous jam that left the entire goal shaking. It set off a festive celebration of the Jayhawks’ first game at the Phog in 29 days. "The last couple practices before this game, I told the guys it would be a fun game to come back home," Tharp said. "I knew it was going to be exciting. I knew it was going to be turned up in there. It was just a good game."